WARSAW, Poland (CNS) — The prefect of the Congregation for the Doctrine of the Faith has advised bishops’ conferences not to take “doctrinal and disciplinary decisions” on issues that rightly fall under the magisterium of the church. His comments came in relation to claims at a recent news conference by Cardinal Reinhard Marx of Munich-Freising, president of the German bishops’ conference, that his church stood ready to “preach the Gospel in its own original way,” rather than being seen as “a branch of Rome” in relation to the possibility of allowing divorced and civilly remarried Catholics to receive the sacraments. “An episcopal conference isn’t a special council, still less an ecumenical council, and its president is nothing more than a technical moderator with no magisterial authority,” Cardinal Muller said in a March 26 interview with France’s Catholic Famille Chretienne (Christian Family) weekly. “Hearing it said that an episcopal conference isn’t a ‘branch of Rome’ leads me to recall that dioceses aren’t branches of a bishops’ conference secretariat either,” Cardinal Muller said. Cardinal Marx caused controversy during a Feb. 25 news conference at the close of a German bishops’ plenary meeting when he said his conference planned to help the church “go down new paths” and “pursue its own pastoral care program” regardless of the outcome of the synod on the family Oct. 4-25 at the Vatican. “We cannot wait for a synod to tell us how we have to shape pastoral care for marriage and family here,” said Cardinal Marx, who will be one of three German church delegates at the synod. “We are not a branch of Rome. Each bishops’ conference is responsible for pastoral care in its cultural context and must preach the Gospel in its own original way,” he said. Cardinal Marx’s statement also was rejected by Cardinal Paul Cordes, retired president of the Pontifical Council Cor Unum. Cardinal Cordes described Cardinal Marx’s comments as “irritating theological blurriness” in a March 7 letter to Germany’s Catholic Tagespost daily. “As a social ethicist, Cardinal Marx may know a lot about the dependent branches of large corporations — in an ecclesiastical context, such statements are rather worthy of the village pub,” Cardinal Cordes wrote. “The sentence ‘We cannot wait for a synod’ was hardly inspired, to say the least, by an ecclesiastical sense of communion. This ‘anti-Roman instinct’ isn’t the invention of some scholars, but a northern reality which displays strong centrifugal power and is highly destructive to the church’s unity,” Cardinal Cordes’ letter said. Support for a change to Catholic doctrine on marriage and family affairs is believed widespread in Germany, where a December 2014 bishops’ conference report suggested most of the country’s 66 bishops believed sacraments should be available to divorced and civilly remarried Catholics. In 2013, the Freiburg Archdiocese issued a 20-page guideline for making holy Communion available. The guidelines subsequently were rejected by then-Archbishop Muller. “Attempts to deduce the content of faith from the experience of human life isn’t as new as claimed here — and it certainly can’t be seen as a ‘paradigm shift’,” Cardinal Cordes said. “The Catholic Church’s faith is nourished by Scripture and ecclesiastical tradition only. Given this unambiguous direction, it would be a paradox to attribute the function of a source of faith to a small group of church members, living in a spiritually pitiable but objectively irregular situation,” the letter said. The German bishops’ conference reported March 26 that it had so far received 1,000 responses to a pre-synod questionnaire circulated to the country’s 27 dioceses and Catholic associations and institutions. The results must be submitted to Rome by April 15. 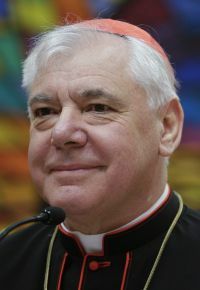 Cardinal Marx’s spokesman, Bernhard Kellner, told CNS March 26 that the Munich-Freising Archdiocese would not respond to Cardinal Cordes’ letter.